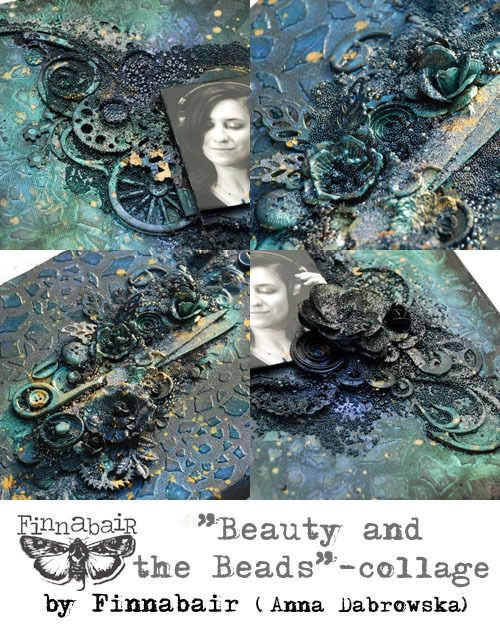 Finnabair: Time to reveal the secret: New Classes for 2015! In the end - I believe it was worth of it all - I'm happy with the projects and I hope you will love them as much as I do. 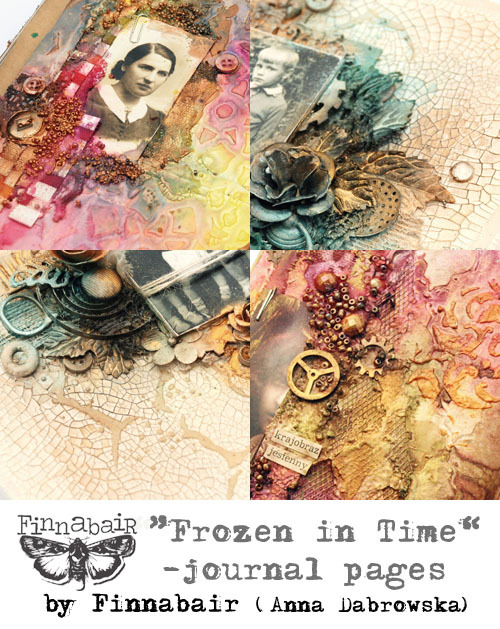 Ladies and gentlemen - here are new Finnabair classes! Would you like to create dimensional, eclectic collage project and learn great altering techniques and ideas? Delicate, muted tones and vintage elements are calling your name? 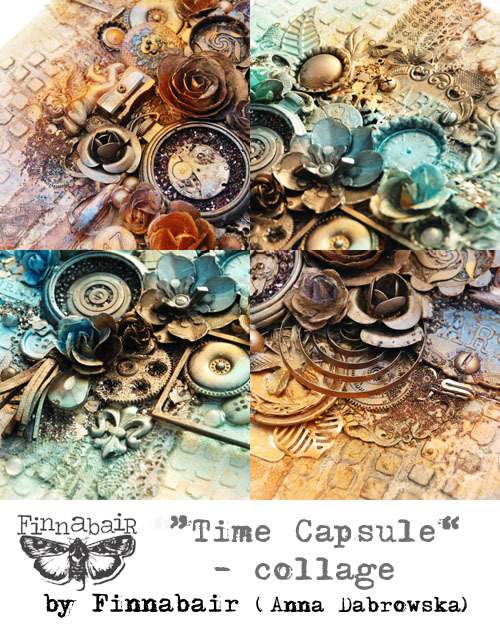 “Time Capsule” class will be perfect for you! During this 4h long class I will share a whole range of intriguing and versatile mixed-media techniques such as dimensional embellishing, creating textures using pastes and fabric, adding metallic, delicate colours to your composition . We will be using art mediums together with Prima Art Ingrediens such as Mica Powders, Mica Flakes or Glass Glitter to create unique, customized look. This is not only the chance to try a bit different way of composing and organizing your project but also finding a way of using the supplies we all have somewhere in our studios, kitchens, garages, gardens... Presented techniques will easily be transferred to home decor and altered art projects – the imagination is the limit! I will help you create your own collage breaking the whole process into small, easy to follow steps, explain the tools, paints and mediums - mostly selection of my own products from Art Basics Line (Light Paste, Clear Gesso, Soft Gel ) and I 'll do my best to help you get the best possible results. Beauty and the Beads - dimensional, dark mixed-media collage with amazing sparkle and shine. What is the best about black colour? It helps other colours shine beautifully – especially if they contain some shimmer or glitter in them! With a little help of Black Gesso, Gels and Micro Beads you are able to create the most amazing, textured, iridescent collage – and this all in simple, easy to follow steps! “Beauty and the Beads” is my idea how to use combination of art mediums, shimmering sprays, stencils, gels and – finally – beads and glitter in a creative way: first making a rich, deep textured background, then working on a dimensional, intriguing composition and finally adding breathtaking layers of delicate texture... all that based on my new line of Art Basics and Art Ingredients line of Prima products. During this 4h long class you will not only create an amazing project you can hang on your wall but also learn a lot of inspiring techniques, discover possibilities of getting custom look and combining the products to get the best results. I'll share my experience and will give you helpful tips about composition, color choices and adding finishing touches. Are you ready to add some sparkle to your life? All the elements, paints and mediums are provided – this project is suitable both for advanced and beginning students. Class may be taught as a collage composition with photo or altered object. The ARTifact - dark mixed-media collage full of texture and wonderful light. Great way of making friends with texture pastes and mica effects. It is all about light and texture... My inspiration for this project were old stone walls, rusted, corroded metal and that feeling of revealing a mystery which was hidden somewhere in the darkness for long centuries. 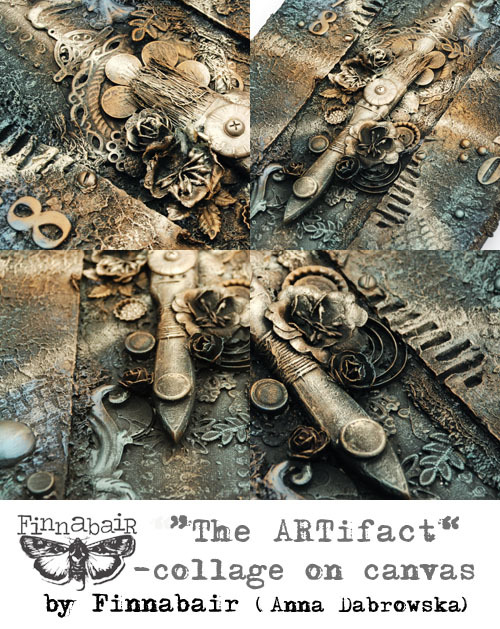 “ The ARTifact” has it all – and during this mixed-media class I'll take you on a creative journey during which we will discover together, layer after layer, the amazing possibilities of using Art Extravagance Texture Pastes and Art Basics mediums. I'll share my ideas for building the dimension and creating a weathered, distressed look with a touch of dark, a bit industrial feeling. I'll guide you through the process of making 3D composition and painting it in the most interesting way focusing on creating a dramatic effect of light and shadow using such products as Black Gesso, Modeling Pastes, Soft Gels and Art Ingredients Mica Powders. During this class you will not only create an amazing project you can display on your wall but also learn a lot of inspiring techniques, discover possibilities of getting custom look and combining the products to get the best results. All these techniques can be easily used on many other projects such as home decor and altered objects or journal pages. “The ARTifact” is an invitation to the world of mixed-media – will you enter? Mixed-media style decorated journal cover with shabby-vintage feeling including techniques based on sprays, gesso, metallic finishing and delicate texture. Would you like to have your own journal or book which will show your love for all things vintage? Are you planning a personal heritage project and looking for some ideas? 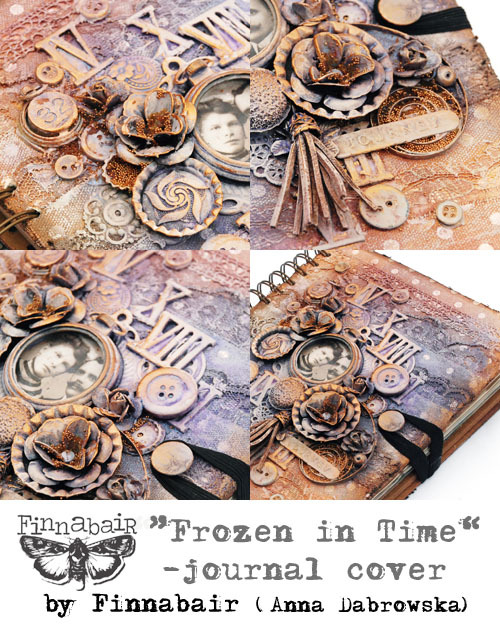 „Frozen in Time” class is perfect for you! Starting with a plain chipboard cover we will use a range of techniques to get unique, multi-layered and romantic look which may be also easily adapted for other mixed-media projects such as home-decor, canvases or even smaller forms such as journal pages. Working step-by-step with me you will see how you can use such supplies as Resist Canvas, fabric, lace, trims, metal embellishments and all the found vintage treasures you may have in your private collection. I will share my ideas for decorating, customizing and finishing the project to suit your needs and personal taste and explain how to use a wide range of art mediums including my own products: Art Basics Soft Gel, Modeling Paste or 3D Gel and White Gesso. You'll also learn how you can finish the project creating beautiful, metallic and dimensional touches using Prima Art Ingredients and a touch of imagination! After the class you will have your own art journal or album cover in style which is an appealing mix of shabby and grunge and a big dose of inspiration: I'll do my best to share my experience, give tips and to convince you to be more bold and artistic – creativity is for everybody and mixed-media is the essence of creative freedom! This 4h class may be accompanied with another full 4h class focusing on collage and journaling techniques. All the elements, paints and mediums are provided – this project is suitable both for advanced and beginning students. 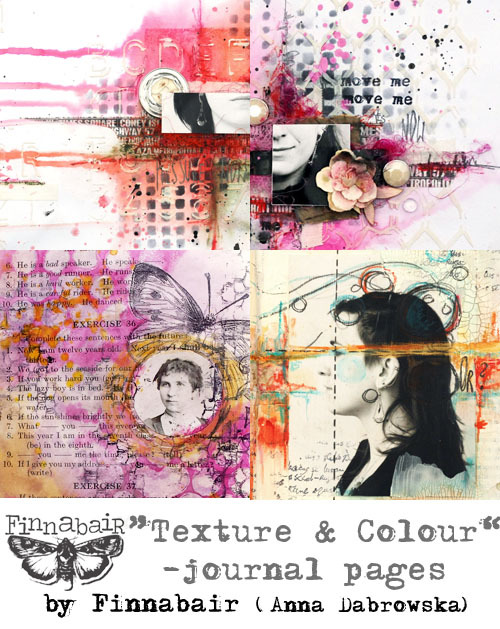 Pages full of texture, layers and color - perfect for collage, home decor and art journaling projects! Are you ready for some creative experiments and mixed-media fun? Journaling is one of the most careless and safest ways of trying new techniques, colors, products – but also the perfect way to simply express yourself visually way. During this class I'll share with you a bunch of my favorite techniques I use in collage and journaling project – especially these which are inspired by old, weathered look, vintage colors, look of old fabric and peeled paint. 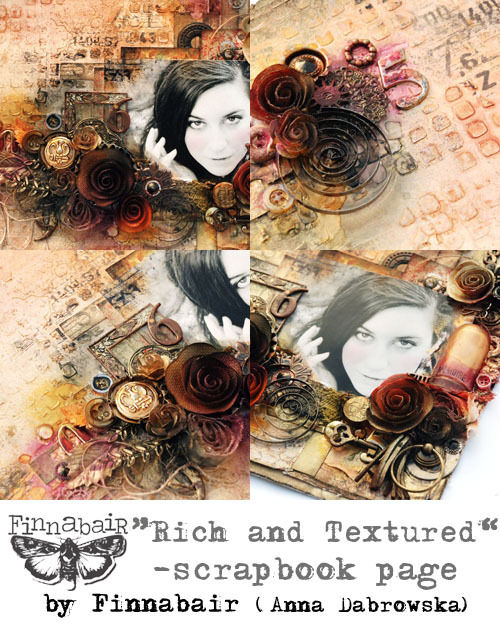 Together we will create 2 double pages focusing on textures and rich, decorated look. We will use stencils, texture pastes, modeling pastes and we will create our own custom mixes. You will have a chance to try Art Mediums from my all 3 lines - Art Basics, Art Ingredients and Art Extravagance – and I can promise the techniques you will learn will be easy to apply to any other mixed-media project! I'll share my experience in working with different kind of books and my ways of choosing the effects, colors and embellishments and encourage you to play and experiment with the supplies and techniques which in a first moment may be a bit intimidating. There are no mistakes here – just interesting accidents! Usual class time – 4h. Try something freestyle, bold and full of creative energy - techniques great for art journaling, scrapbooking and mini books! Journal is your creative playground and your personal diary in one, safe space to express your feelings, emotions, thoughts or just try new supplies and ideas. Sometimes the unexpected effects and “happy accidents” are the ticket for a new trip which will take you to the lands you've never been before! During this class I'd like to take you on this kind of journey: places where I was experimenting with simple textures, bold colours, contrast and a lot of free space. Starting with a white cardstock we will build 3 double pages focusing on self expression and techniques based on a variety of artistic mediums. With stencils, stamps, resist techniques, dimensional effects, sprays, acrylic paint, inks and watercolour pencils we will be able to create unique, personalized pages and discover the beauty of texture and colour. In the classroom we will be working with a selection of products from my Prima Art Basics, Art Extravagance and Art Ingredients line such as White and Clear Gesso, Modeling Paste, Soft Gel and other interesting art supplies. All the backgrounds, embellishments, paints and mediums are provided – this project is suitable both for advanced and beginning students. Scraps of Memories - mixed-media scrapbook page focused on delicate colours, customizing the background and embellishments and creating with scraps. Dimensional, detailed composition, a bit of texture in the background and delicate, velvet looking colours may be a perfect recipe to create beautiful mixed-media style scrapbook page. “Scraps of Memories” class is focused on embracing these little bits and pieces left on our working tables: leftover flowers, scraps of paper and lace, some trinkets, some buttons... all these put together are great start for eclectic looking, intriguing project which will be possible to customize right from the bottom to the very top! During this class I will create with you step-by-step interesting, lighter in style page which will include such useful and inspiring techniques as using pastes and stencils, background stamping, building 3D composition and customizing the look of your embellishments using art mediums and colour. “Scraps of Memories” is a great chance to get familiar with Art Basics and Art Ingredients Line of products including Modeling Paste, Clear Gesso, Soft Gel, Mica Powders or Glass Beads and have some serious creative fun stepping out of your comfort zone and making your fingers dirty! All the backgrounds, embellishments, paints and mediums are provided – this project is suitable both for advanced and beginning students. Usual class time: about 3,5-4 h.
Rich and Textured - mixed-media scrapbook page including selection of art mediums, rich embellishing and creating distressed, grungy look. 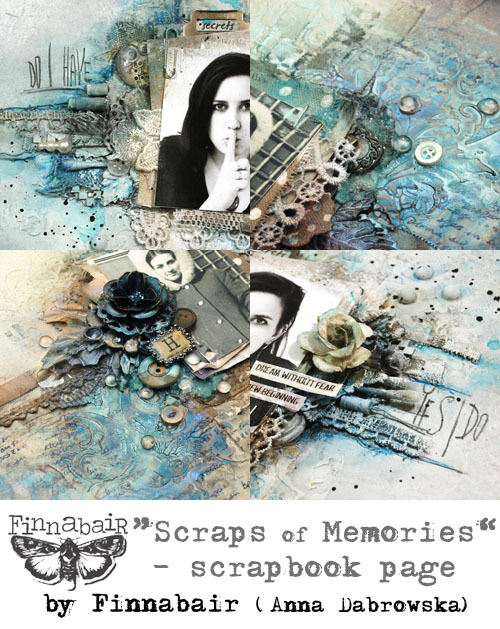 Do you want to add dimensional, mixed-media twist to your scrapbook page? “Rich and Textured” class is based on mixedmedia and scrapbooking techniques such as multi-layering, stamping, using a art mediums such as Art Basics 3D Gel or Clear Gesso and loads of elements to create one-of-a kind, personalized project. During this class I will share my experience in building complex composition, background and adding final touches to the page and will try to convince you that creating a grungy, eclectic layout is possible with all kinds of supplies – it's great moment to look again at your embellishments and maybe give also simple everyday objects a chance to shine! "Rich and Textured” is a perfect combination of fun, experiment and playing with composition, colour and texture. All the backgrounds, embellishments, paints and mediums are provided – this project is suitable both for advanced and beginning students. Usual class time: about 4 h.
I hope you are as excited as I am! Or maybe more? Please let me know which class seems to be your "favorite" - I'm so curious about your choices! I'm so looking forward to see you in my classrooom! Amazing! Well done!! I love the last 2 classes - the lighter one & the rich & textured. And also the art journal cover. But I would attend any class you teach! I wish I could attend your class in South Africa without having to attend 2 other compulsory classes as then I would definitely be coming!! I would take them all. Your art is beautiful. You are on my bucket list. I will take at least 1 of your classes in my life. Whats the cost of these classes? Are they going to be online? Mad Rian - these are in person classes - so far. cost will be different in different places depending on the event and decisions of people organizing the events. I hope to launch some online classes too - but so far no success with that! sorry! Great classes, I'd like to visit all. I love them all and if money was not an issue I would attend them all. But the ARTifact, rich and textured, frozen in time and time capsule would be my absolute favs!!! Wow, such great inspirational classes. Maybe there will be classes in Germany again. My absolute favorite out of all those great themes is definitely the ARTifact :). These all look fabulous - any classes coming to Northern Ireland? I would do your on-line classes in a heart beat!!! Am not able to choose between these projects, al are so amazingly filled with texture and colour...!!! Rich and textured!!! But they are all amazing. I like Time Capsule and the Artifact. Milla, I've sent the list to the Version Scrap Organizators - they should contact you with that but it is not long or complicated! I love all of these I hope you do some online classes for the people that cannot be there in person I will take ALL of them!! I love the first one and the frozen in time cover. If your teaching anywhere close to me I'll be signing up. Love them all. If I had to choose just one I would pick "the Artifact" Awesome work!!! Love them all! When are you coming to NY again? Wow there isn't one that I wouldn't want to take but the chances of anything coming to our side of Canada is pretty remote and yet you'd think Toronto is a big enough city to drum up the necessary audience. I'd travel three hours for this!!!! Eila <3 <3 <3 love you girl!! Wonderful line up of classes. They would all be great.